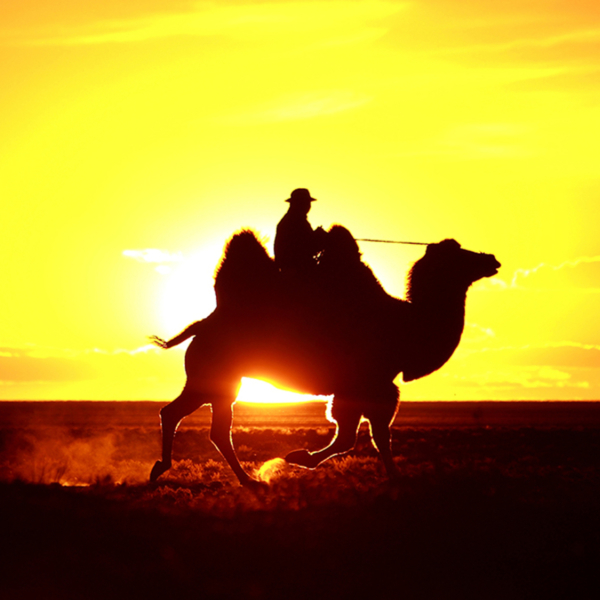 This trip is designed for those who want to see the best of Mongolian in comfort and style. We will take you by plane to two of the most attractive regions of the country- where you will be visiting two national parks - “ Gobi’s Three Beauties” and the singing sand dunes, and Khuvsgul Lake national park, home to a wide variety of wildlife and diverse ethnic minorities. This trip is run using the best accommodations and transport available in Mongolia. This morning we drive back to the airport, for the short domestic flight down to the Gobi Desert. We land in Dalanzadgad, the capital city of South Gobi Province. Once a remote desert town, it today serves as the center of logistics for the developing mining industry. Over the last decade, massive exploration operations have revealed in the Gobi Desert an abundance of precious metals and minerals. And thus, the once peaceful desert is being trampled by excavators, monster trucks, and massive drills- all in the hope of making a quick fortune. Luckily, most of these mines are far from the eye, but their environmental impact can be seen and felt throughout this massive desert. Upon landing in Dalanzadgad we meet our driver, and embark on a one and a half hours’ drive to the ‘Gobi’s Beauties’ Nature Reserve. Once at the reserve, we head to the ‘Vulture’s Valley’- a beautiful oasis at the foot of the ‘Three Beauties’ Mountain range. As the rays of sun does not reach the small river at the creek’s basin, it is kept frozen throughout the beginning of the summer, and hence, the place is commonly known as the ‘Gobi Glacier’. We take an easy hike along the beautiful stream, and if lucky, we get to see some of the wildlife inhabiting the reserve. Overnight in a ger camp- the cozy yet simple, Mongolian version of a lodge, consisting of traditional felt-made dwellings the nomads of Central Asia often refer to as yurt. We leave our camp, and head towards Khavtsgait Petroglyphs, located on a cliff overlooking the vast Gobi Plains. Here, in what was once an ancient place of worship, or place of congregation, beautiful petroglyphs has been inscribed on the rocks. The rock paintings depict scenes drawn from the daily lives of those inhabited the region hundreds, and even thousands of years ago. Another four hours of driving through the Gobi’s typical cold desert landscape, so called because the Gobi receives its moisture in the form of snow, brings us to the Khongorin Els sand dunes. After a late lunch at the ger camp where we will spend the night, we will go to explore the towering dunes on foot. If the breeze is blowing just right, we may hear the dunes singing to us. The rugged desert plants of the Gobi at the edges of the sands are beautiful in their own sculptural way. Overnight in a ger camp. Our first stop of the day would be at the place known to westerners as The Flaming Cliffs. Bayan Zag (Rich with Saxaul) is famed for its red sandstone cliffs which take on beautiful red and orange hues during sunset. The area is also recognized as one of the world’s largest dinosaur graveyards. In 1921, the American Roy Chapman Andrews discovered here some of the most important Paleontological findings of the last century. We arrive at Bayan Zag around lunch time and spend the afternoon exploring the cliffs on foot, as we wait for the sunset to set the cliffs “aflame”, if weather permitting of course. We then take the about one-hour’s drive back to the ger camp in which we stayed in our first day in the Gobi. This morning we drive back to Dalanzadgad airport, for the flight back to Ulaanbaatar. Landing back in the Mongolian capital, we embark on the one and a half hour drive to Gorki-Terelj National Park. The park features unique rock formations, scenic valleys, a winding river, and restful groves of trees. Many nomads live in the park itself, where they find good grazing for their animals. If time permits, we will take a short hike to a nearby hill, from where we watch the sun set over the park (weather permitting of course). We will spend the night in a ger camp in the park. This morning we take an easy hike to the famous Turtle Rock, a symbol of wisdom and longevity to the Mongolian people. We then continue hiking to Ariabal Temple. The temple has been recently reconstructed, after the original temple had been destroyed during the communist purges of the 1930’s. A site of great tranquility, it functions today as a meditation center to Buddhist monks. After lunch, we leave the park and drive to the newly constructed Ghengis Khan Monument. Rising 40 meters in height over the surrounding steppes, this mighty structure plays a major symbol to the renewing Mongolian nation, after more than 300 years of foreign sovereignty over its people and territory. We then head to the Mongolian Capital, where we spend few hours exploring the Black Market. This huge market contains every single item a Mongolian might need, whether they are nomads or urban apartment dwellers. Goods brought from all corners of Mongolia are here for sale. A visit to the market is a colorful experience which gives the visitor an insight to the everyday life of the people of Ulaanbaatar. We then drive to our hotel in the heart of the city. We once again drive to Ulaanbaatar airport, from which we take a morning flight to Murun, the capital city of Khuvsgul Province. From the airport we drive to the local market for a quick walk around it. A short while later we arrive at an ancient burial site, featuring Mongolia’s mysterious deerstones. These memorial stones represent important leaders and warriors, carved with deer motifs. After visiting the site, we continue our trip northwards. One of the world's largest fresh water sources, Lake Khuvsgul and its amazing surroundings are home to several of Mongolia’s ethnic minorities, among them are the Tsaatan, or better known as the reindeer people. The protected area surrounding the lake is a refuge for a wide variety of wildlife. We arrive at the lake’s shores late in the evening, and check in our ger camp for the night. An exciting day of activities awaits us! In the morning hours we take a mountain biking trip along the trails leading up to the mountains surrounding the lake. This thrilling ride would take us along horse trails criss-crossing the thick pine forests, with the views of the lakes popping up through the clearing in the woods. We return to the camp for lunch, before taking a kayaking trip over the pristine lake. In the evening we return to our ger camp on the lake’s shores. Today we take a hiking trip through the forests and meadows nearby the lake. Lying around 1650 meters (5413 feet) above sea level, and surrounded by mountains that rise over 3100 meters (10170 feet), the waters of Khuvsgul are deep and spectacularly clear and pure. We will hike to a beautiful vantage point, locally known as ‘Khyasaa’ (in Mongolian- steep cliff), from which we get a marvelous view over the ‘Blue Pearl’. In the evening we return to our camp for a third and last night. After an early breakfast in our camp, we drive back to Murun, taking the first available flight to Ulaanbaatar. Upon arrival, we drive to the Museum of the Victims of Political Oppression. Though rather small in size, this museum, located at the home of Mongolia’s first prime minister, which later vanished in the Siberian steppes without leaving any trails, gives a dark testimony over Mongolia’s rather recent history, when thousands of people have lost their freedom and lives during the communist revolution. After lunch we pay a visit to Gandan Monastery, Mongolia’s largest religious institute, home to the 26 meters high Janaraysag Statue and one of the only religious structures which have survived the anti-religious purges of the 1930’s. With a bit of luck, we would arrive in time to attend the morning Puje ceremony, in which the monks chanting Tibetan scripts. We then visit the Zanbazar Fine Arts Museum. This museum holds some of the best known Mongolian works of art, including the well know ‘One Day In Mongolia’ painting, painted by B. Sharav, and considered to date as a true masterpiece. The museum also holds unique religious and other historic artifacts. In the evening we enjoy a farewell dinner, followed by a visit to the Zaisan Hill, for a view over the city at night. Overnight in Ulaanbaatar.